Upstart Wyn: Our Book Is Almost Finished! Our Book Is Almost Finished! For almost two years, I have been co-writing a book on entrepreneurship. When I began the process, I had no idea that writing a book would take so much time, thought and energy. The main author, Ed McLaughlin, wanted to share the knowledge he had gained from quitting the corporate world and starting two businesses in the midst of a recession. One business was a failure, but the other one was a roaring success. Ed grew the successful one, USI, into an Inc. 500 company and sold it to a Fortune 100 company. He learned plenty along the journey. Long before Ed approached me to write the book with him, I had been longing to take the knowledge I have gained from working with entrepreneurs and put it in a book. I wanted to help entrepreneurs and want-trepreneurs to know the process they needed to go through to build a sustainable business. The problem was how to differentiate the book from everything else in the market. How to cut through the clutter. Enter Ed. In the book, we take you, the reader, along on Ed's entrepreneurial journey. As his story unfolds, you will learn the process of creating, growing and selling a business. You'll discover essential principles of running a successful business. And you'll read about the real life of a real entrepreneur -- all the ups, downs, and anxiety. The book is titled: The Purpose Is Profit: Secrets of a Successful Entrepreneur from Startup to Exit. Like all good authors, we've created a website for the book -- www.thepurporseisprofit.com, and we are blogging regularly to share our knowledge freely with anyone who is on the fence about starting up or who needs to know more about the mechanics of starting and growing a business. Read the blog at: http://www.thepurposeisprofit.com/blog-page/. We are currently offering a preview of Section 1: The Pull to Become an Entrepreneur. It's available as a download on our website. Just click on the offer. I'll be posting more on what it's like to write and publish a book in the near future. Follow along on the journey. I haven't been posting much on this blog because I've been so busy with the book and the book's blog and social media. 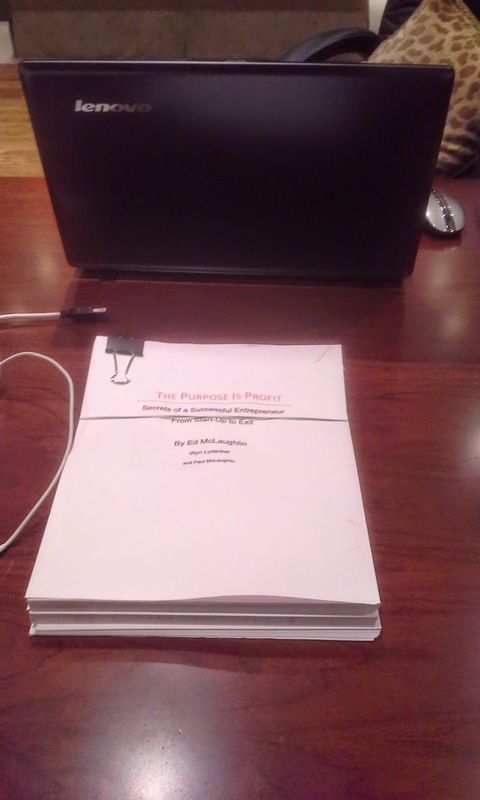 The Purpose Is Profit has just entered the editing stage. The design stage is next. Stay tuned.